It is very important that Israeli dates are avoided this Ramadan and every Ramadan that follows. Salaam. It’s been a while since I’ve posted anything on this site, time has unfortunately got the better of me. So, Ramadan is just around the corner, and Ramadan means dates in our supermarkets and independent shops. Now, there’s an issue with these dates. This issue being a lot of the dates that are sold here in the UK come from illegal Israeli settlements in Palestine. That is land that rightfully belongs to the Palestininans are being used to grow dates, which are then sold to us Muslims, and the profits going directly back to those illegal settlements. Do you see the problem? How can this be avoided then? Well, we must familiarise ourselves with the suppliers of Israeli dates and avoid buying them. 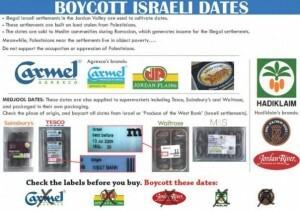 A lot of independent Muslim shops are not aware that they are selling Israeli dates, we must let them know. Spread the word, and let’s not allow Israel to grain profit from us Muslims this Ramadan and then use this money to further oppress the people of Palestine. InshaAllah (God willing) this message is spread far and wide amongst everyone that believes that Israel’s terrorism must not continue. Only together can we defeat the atrocities that is committed by Israel on a daily basis. Spread the word! Facebook, twitter, MSN, whatever you use!